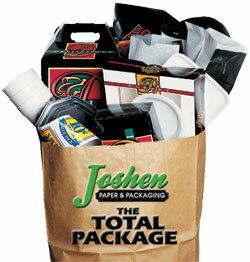 Joshen is a supplier of Winco smallwares & equipment for all your front to back of the house needs. Click here to view catalogs, then contact your Joshen rep to place an order... it is that EASY! Categories You Won't Want To Miss! Click here to learn more about the newest technology in the floor cleaning industry. Stripping without chemicals! Decrease your labor and chemical costs while helping the environment! Make sure to watch the demo video! Grab Consumer's Attention! High R.O.I.! Are you ready for a uniquely different marketing tool that offers your company an effective alternative to the standard newspaper advertising insert for special promotions? Thanks for stopping by to learn more about Joshen Paper & Packaging's supply chain solutions! At Joshen, you're not a faceless number and your needs will always be a top priority. We recognize that every customer is an individual with specific needs. Whether these needs are a custom warehousing and transportation program, supply products, ordering methods, or procurement solutions, Joshen will develop a customized complete supply chain model specifically for you so that you can focus on your core business! Our commitment to our customers extends well beyond just delivering supply products. So browse our site, and discover how Joshen can substantially reduce your supply costs across all supply chain processes. It's not just a slogan, Joshen truly eliminates the need for costly multiple suppliers. With an inventory of more than 20,000 supply products, all of your needs to operate your business are taken care of at the lowest cost. With our expansive truck fleet, we can have the products you need at your location in the shortest time possible; or take advantage of Joshen's backhaul program to further drive down your supply costs! Along with our timely delivery, our procurement systems ensure you won't be out of supplies and be faced with operational issues or missed opportunities. That's The Total Package we deliver! With Joshen you can be at ease, because Joshen boasts an industry-wide reputation for timely delivery while maintaining an average fill-rate of more than 98%! 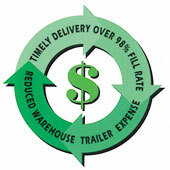 You'll also know we are driving down your supply costs, which improves your bottom-line. How can we say this? We're confident Joshen can benefit you and your company because we have a proven track record of saving our customers up in double-digit percentages on supply cost-of-goods. For Joshen customers, this savings cycle continues by taking advantage of reduced warehouse and trailer expense for your supply products. Joshen is The Total Package in Savings! Joshen's Manufacturer of the Month Showcase is where we acknowledge a manufacturer that has proven to have excellence in product quality, innovative product development, customer service, and an on-going commitment to react to the evolving industry changes of our customers. Crown Poly is a global plastic manufacturing company offering customers a complete innovative bagging system for produce, meat, bakery, bulk, ice bags and consumer-end products. In the fall of 1991, Crown Poly was founded in Los Angeles, California. Having worked for many years with the grocery industry, the company’s founder recognized a need to simplify consumer’s lives and improve the bottom line for supermarket produce departments regarding plastic Produce Bags. The result of this significant engineering R&D investment is the now industry standard and market leader, Pull-N-Pak® Bagging System. In each new market Crown Poly brings the same commitment to innovation and leadership. As a Los Angeles-based company, Crown Poly prides itself on developing innovative products. It is integral to their mission statement and has facilitated their success. All of their products and dispensers are manufactured in the U.S. and are covered with numerous U.S. and international patents.